If the constant buzzing and heat from your many computers distracting you from productive work, than setting up a server room may be for you. It is an advisable idea to house the servers in their own space, even absent of the annoyance of a server stack. There should be enough space in the server room to house the servers and equipment. Some equipment includes tapes, disks, cooling fans, or any other parts. Just an FYI: Do not place the data backup system in the server room. This should be placed in a separate room in event of a flood, fire, and other disasters. When deciding the size of your server room, it is important to consider any growth in the future. Once the equipment is set up in the room, you will likely not want to move it again. If there is extra space in the server room, you may add extra machines without paying construction to expand. Power supply to the server room is essential for the equipment, for servers and cooling units. Decent lighting is also important for a server room. Power supply is a concern as well as cooling options that will best for the space. When designing the server room, consult you IT staff to best advise the equipment needed. Most importantly, ensure the cleanliness and tidiness of the room. Location: The location of the room is the first “consideration” before designing the layout. The consensus for the server room is one of the walls should not be an exterior wall. Exterior walls of the building are usually damp or enclose water pipes. Water pipes pose the threat of bursting and flooding the sensitive equipment. Exterior windows pose a security risk and any damages. For those that can avoid top or bottom floor for the server room placement, can avoid any floods or roof leaks. You may even place a server closet on each floor if a center server room is not possible. A server closet is usually stacked on each floor and contain servers, network and telecommunications equipment. AC: The computing equipment tend to create heat or overheat. The equipment is also quite delicate to heat, dust, humidity, or cold. Equipment must all have high resilience and failover testing. Managing consistent temperature with low humidity and tight tolerances are essential to maintaining IT systems. The recommended server room temperatures are 65-80°F and humidity between 40%-60%rH. The air conditioning systems depend on the different designs and structures. The two types of air conditioning systems for server rooms are up-flow and down-flow structures. Fire-Protection: Fire protection systems function to early detect and alarm personnel to a fire. Followed by controlling the fire and preventing any harm to personnel present in the building. Fire suppression technology in the server room developed at the start of the server room. Halon gas is commonly used in most server room although studies show it is ozone depleting and unsafe to humans. More contemporary server rooms replacing Halon gas with Nitrogen, Argon, or CO2. While others use a clean chemical (FM200) or hypoxic air known as an oxygen suppression system. Man businesses use FEP coated tubing to avoid the fire spreading to data cables. The plastic guards the metal and prevents heat generation. Future Proofing: As technology changes and advances, the needs for the server room are changing and evolving. The server room designs should account for future proofing. Future proofing allows any new requirements to be added with little renovation. Cooling and power requirements will change over time. The basic guide says for every 100kW of computing installed, an additional 30kW must be installed to cool the equipment. 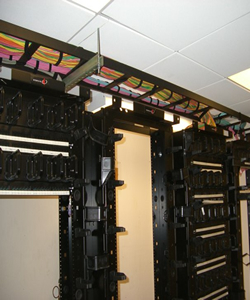 When determining space in a server room, the rack integration system is key to the organization. 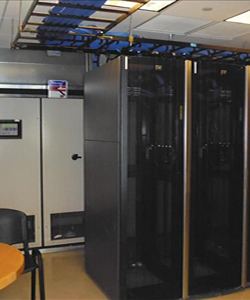 Several server rooms use relay racks or rack cabinets to utilize the space best. A single 19 to 23in rack can hold around 45 to 100 servers. Redundancy: Common-mode and single points of failure are important especially in businesses where computing systems are vital. Factors to consider are whether the business can handle interruption during the switch to the failover system. Should the network remain seamless? Computer hardware redundancy prearranges cooling and failover systems. TC Area: The server room should maintain a limited space to contain the telecommunication system. This space functions to attach the wiring to the local area network. Although the area is smaller, personnel should be able to access the wiring to install or service the systems. Also included in I.T. Rooms are routers, wiring hubs, and bridges. Telecommunication access is determined by the network size. Connecting the IT infrastructure to the users is vital to the function of the network. Storing hardware and organizing wires simplifies the changes to a network. Another benefit is assisting in avoiding clutter in the network topology by analyzing any connection and devices that are unnecessary . To establish a server room requires investment and design, but the outcome is worth it. The increased data security, longevity in equipment, and a better functioning workspace are added benefits to including server rooms in the space. We can assist you in finding and creating a great office with server rooms – contact us with no obligation or fee.